They say inspiration comes when you least expect it. I’m finding that that is often true. In New York, sometimes we get a little jaded by the monotony. The fifteen hour day, on a rainy day, makes you want to curl up in the fetal position in bed and not move all day. It was one of those days, and I was walking to the subway, before the sun even came up, going to work. 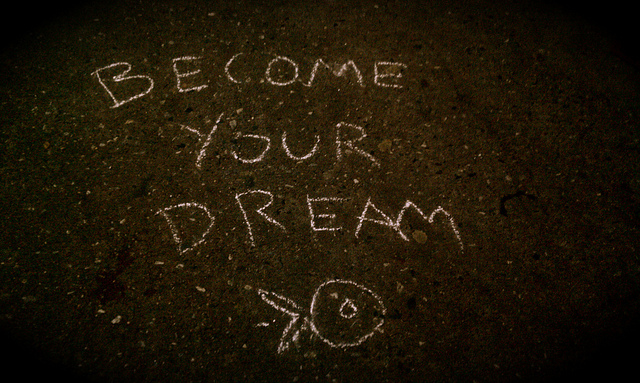 I came across writing written on a piece of broken furniture on the curb: “Become Your Dream.” Those three simple words were not only the most unexpected graffiti, but the most inspiring thing I could have read. Simple as it is, it instantly put a smile on my face and made me want to continue with my day. Since then, I discovered it was an artist that does his work all over the city, and I continue to find it all over the neighborhood. Every time I see it, I can’t help but smile because in the midst of the hustle and bustle of the city, someone is there to send the message and remind us what its all for. Other times, however, inspiration is all around you, and you know exactly where to find it. I am inspired every single day by the things that my fellow lifters and and I do. Not only are we blessed with the ability to do what we do, but the drive to be better and persevere despite the negativity around us, is simply amazing. The constant hunger to find the ability to outdo yourself. We are told all the time that we are going to hurt ourselves, or we are not going to be able to do it one day, or what’s the use if there is no future in making a living off of it, or whatever excuse it is that day for someone to tell us we are not doing anything worthwhile. We just keep on, keeping on, because we know that what we do may not be understood by anyone that doesn’t know what it feels like. Continuing to prove people wrong is a pretty great feeling too. He believes in us, even when we think that it will be a tough meet when mother nature gets in the way, or when that 285 is glued to the damn floor. Inspiration and the reminder that you’ve got it, even though you have doubt, moves mountains, or iron in this case. Human strength is one of the most inspiring things we can encounter in life. Whether it be the brain power to create strategies to change the world, the emotional strength to hold solid ground when the people around you need some holding up, or the ability to deadlift 1000 pounds, challenging the human potential is nothing to shake a stick at. Physical strength is an amazing feat to witness. Someone once told me that physical strength is the most absolute thing in this world. I had never thought of it that way before. When you take away the value of money, it is just paper. When you take away power structures in government and society, you just have people. When its just people, all you have is what you’ve got. Either you are strong enough to survive, or your not. There is nothing more absolute than that. We would NEVER be where we are and have accomplished as much as we have in our first year of powerlifting without inspiration. Hopefully, we can strike up some inspiration to others as well. Thanks to all that continue to inspire. “Become Your Dream.” Pass it on. It’s contagious.